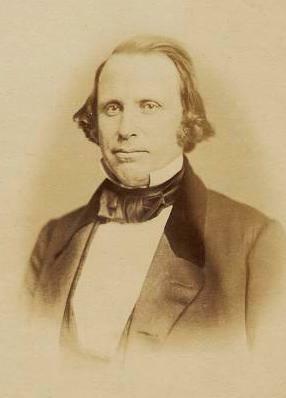 Senator Henry Wilson (1812-1875), founder of the 22nd Massachusetts and future Vice-President under Grant. Photo c. 1860. Today marks the 150th anniversary of the establishment of the 22nd Regiment Massachusetts Volunteer Infantry. Just one of many Massachusetts regiments that went off to war in the summer and fall of 1861. But significant to me and many of my fellow reenactors because we represent Company D of the 22nd Massachusetts. The 10 companies that became the 22nd Massachusetts had, for the most part, been in training at Camp Schouler in Lynnfield for about a month before Gov. Andrew signed Special Order #483 on September 28, 1861. In that order, Andrew specifically designated which companies would comprise the 22nd Massachusetts and placed Senator Henry Wilson (now Colonel Wilson) in command of the new regiment. Wilson had been pushing for this for some time. It was an unorthodox way to raise troops. Wilson was the junior U.S. Senator from Massachusetts, a Radical Republican opposed to what he (and others) referred to as the “Slave Power,” and the Chairman of the Senate Committee on Military Affairs. He had personally witnessed the Union rout at Bull Run and was so disturbed that he promised President Lincoln he would raise a full brigade in Massachusetts (multiple regiments of infantry plus attached cavalry, artillery and sharpshooters). So, here you had a U.S. Senator sticking his nose into the business of Governor Andrew and the Massachusetts Adjutant General, William Schouler. It is the latter two who were ultimately responsible for organizing and sending Massachusetts units off to war. I don’t think this idea went over well with them. Well, there’s a red flag. No sign of correspondence between Andrew and Wilson about the formation of the 22nd Mass except for evidence of a purloined letter? Indeed, perhaps it is useless to speculate as to what that means. But…I will nonetheless. My sense is that Governor Andrew did not appreciate Wilson’s interference and correspondence between them might have been a trifle testy…and therefore discarded. Just speculation, mind you. It may well have been frustrating to Andrew to have Wilson to barge in and pluck up the best of the companies then forming in Massachusetts for his own special brigade. But Wilson’s actions did have a positive effect. He was a popular political figure, not to mention a former general of the Massachusetts militia (which was, of course, not so much a military accomplishment as it was a political one). When he came home to Massachusetts to recruit, people heard about it and hundreds of men rushed to sign up. Not quite enough, though. As the weeks rolled from August to late September, it became clear to Wilson that the brigade idea would have to be ditched. It would take another month at least to recruit that many and at this stage of the war, there was an urgency…a sense that if they didn’t move fast enough, they would miss the whole thing. So, Wilson settled for one regiment, which Andrew designated the 22nd Massachusetts. It was distinctive in that it was accepted by the War Department above and beyond the quota that Massachusetts had been asked to supply, a special favor to Senator Wilson. Also unusual…There had been some progress in recruiting artillery and sharpshooters for the aborted brigade, and so the 2nd Andrews Sharpshooters and the 3rd Massachusetts Battery were attached to the 22nd Massachusetts. It became the only regiment in the Union Army, that I’m aware of, with its own attachment of artillery and sharpshooters. The average soldier in the 22nd Mass was probably oblivious to all this upper level wrangling and organizing. They were busy drilling and drilling on the old race track in South Lynnfield that had been dubbed Camp Schouler. I have not made a thorough analysis of their occupations, but scanning through Massachusetts Soldiers and Sailors I find that they came from all walks of life. In fact, given that they came mostly from urban areas, we find a large number of skilled tradesmen, far more than in your typical unit from rural areas. They were carpenters, newspaper reporters, printers, gilders, hatters, jewelers, merchants, clerks, musicians, coopers. And yes, a good number were also laborers, sailors and farmers. I have made a careful analysis as to where they were from. The plurality of 36% were from Boston (including Roxbury, Charlestown, etc.). Another 19% were from Middlesex County, mostly Cambridge, Woburn and Reading. From Essex County came about 18%, mostly from Haverhill, Lynn and Salem. Bristol County ranks next with 9%, almost all of these recruited in Taunton. The remaining 18% hailed from towns scattered all across the Commonwealth, 148 Massachusetts communities in all. There were also 53 soldiers from out of state, from such distant places as Newark, NJ and Boothbay, ME. These included a curious clump of 18 men from Jamestown, New York. I wonder what brought them to Boston? On October 8, the men of the 22nd Massachusetts received the order to strike their Lynnfield camp and boarded trains for Boston. They formed their regiment at Haymarket Square, marched up State Street to the Common and there were presented with their colors.